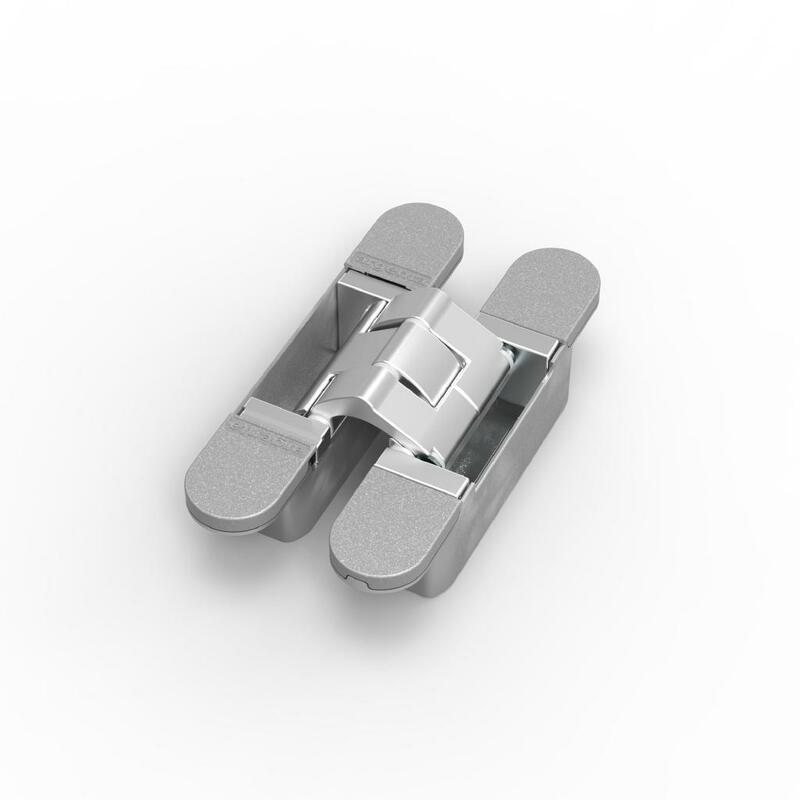 As a specialist in hinges and lift off hinges, Argent Alu nv presents an extensive range of concealed, 3-dimensional, and adjustable hinges: the argenta® invisible. Thanks to the argenta® invisible, the door closes perfectly in line with the wall without any of the hinge being visible. This invisible hinge allows you to open any door to 180°. The sublime design series argenta® invisible neo offers a perfect, pure, and aesthetic finish (no visible screws and available in trendy designs) together with a sophisticated, faster, and simpler installation facility: ‘Easy-Hook’ (fitting and 3D setting by only one person). The argenta® invisible neo is a series of concealed hinges with an exceptionally high and sublime finish; not a single screw is visible. These hinges can be fixed in an easy, flexible and quick way thanks to the unique height adjustment system: you no longer require wedges to place under the door when adjusting the height. The built-in “Easy-Hook” system ensures that the door can be installed in the frame and adjusted by just one person. The hinge’s casing can already be installed in the door in the workshop. The argenta® invisible pro XS-4 is a concealed, compact, budget-friendly, simple, and adjustable hinge which is sold only in bulk. This new series of invisible hinges is aimed mainly at professional large-scale users. With this universal hinge, the screws aren’t visible and it has an opening angle of 180°. 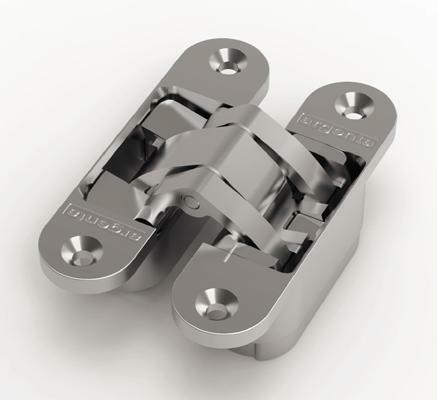 A great advantage of this hinge is the 23mm depth, which allows an easy installation in small door frames. 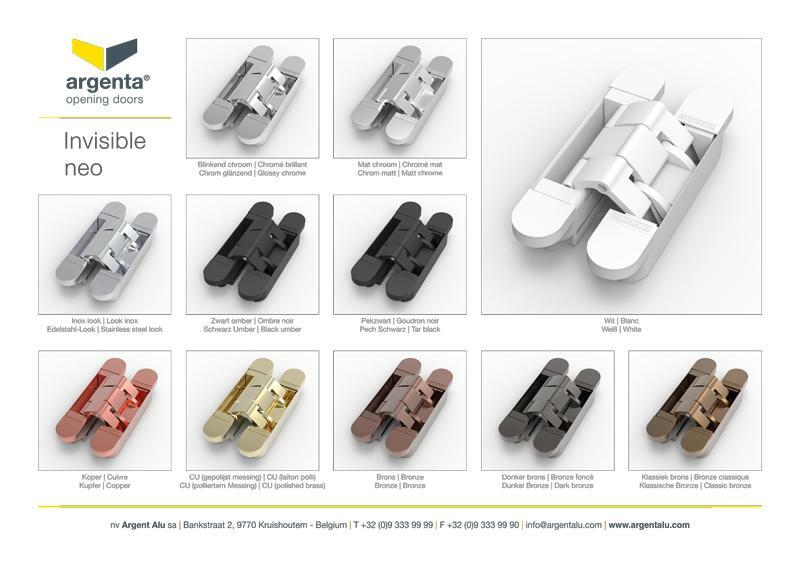 The argenta® invisible small and medium are highly compact, 3D adjustable hinges. The screws are always visible to give these hinges a technical look. These standard invisible hinges are reversible (i.e. they can be used on both left and right-opening doors) and are easy to fit.